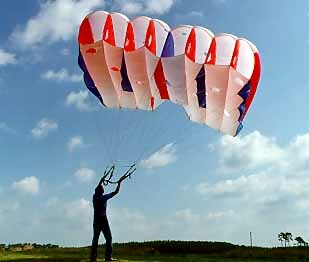 This is the story of the Flow Form®, a kite that was first developed almost 30 years ago by Steve Sutton, a Canadian parachutist who was interested in making aerodynamic improvements to early "wing" type parachutes. 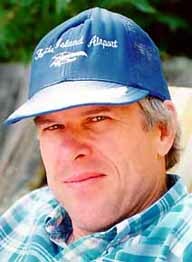 Steve Sutton began his sport parachuting career in 1965 at the age of 19. He was a member of Canada's National Parachute Team from 1970 to 1972. He competed in two World Championships, winning silver medal in men's accuracy in 1972. Now living in Toronto, Canada, he is the owner of a graphic arts and fine art publishing business.  He is still involved in aviation, and for the last fifteen years he and his wife Kathy have flown ultralight airplanes on floats at their cottage on Georgian Bay (one of the Great Lakes, north of Toronto). They are currently building a new plane (a Stoddart-Hamilton GlaStar) which they will fly in the homebuilt category. 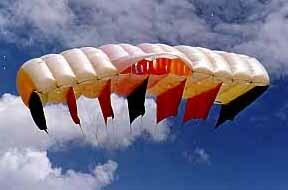 In the early 1970s, Sutton started modifying his parachutes to improve their flight characteristics and stability. A few years later, he used his aerodynamic concepts to develop a series of kites of different sizes. Since then, the Flow Form® has become a popular choice in the recreational kiting community. Easy to launch in either light or heavy winds, the Flow Form® is stable, reliable and light on the line. Flow Forms can be identified in the sky by their deep cells, square shape, vents in the top and bottom surfaces and large open area in the trailing edge. As Sutton developed and tested his designs, his goals were to harness the abundance of high-pressure air in a foil-type kite or parachute, and use it to create both thrust and stability. The features he developed (and later patented) included a series of vents in the top and bottom surfaces of the wing, and a large vent in the trailing edge. All Flow Form® kites have very deep profiles. These large cells provide a stronger and more stable structure. 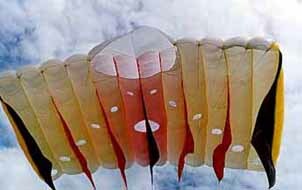 Although one would expect this to result in a huge amount of form drag, in fact, drag is greatly reduced because of the large volume of air that passes through the kite. This explains why the kite is so light on the line, even in heavy winds. As well, the Flow Form® is self-regulating, maintaining constant flight characteristics despite changing wind conditions. 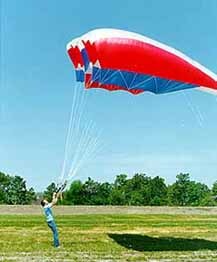 This is because the kite adapts to different amounts of air flowing through it. Sutton's concepts had never before been used in the field of aerodynamics. 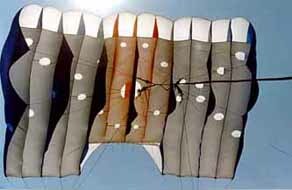 The original airfoil-type parachute design by Domina Jalbert, and later developments by others, were all limited to using the air entering the front of the cells to maintain inflation (hence the name "ram-air"). Sutton's concepts were new in that they allowed differing air pressures to flow through the structure in a thrusting and stabilizing fashion. The result was a kite with excellent flight characteristics. In 1984, Sutton granted a license to Air Affairs Inc. of Hatboro, Pennsylvania as the exclusive manufacturer and distributor of the Flow Form®. Since then, Helen and Jerry Murphy of Air Affairs have developed a very successful business, marketing the Flow Form® in a range of sizes from the "Exciting" 4 square foot to the "Giant" 252 and the "Awesome" 450. For more information, contact Air Affairs Inc., 107 Chelsea Road, Hatboro, Pennsylvania 19040, U.S.A. (Tel. 215 672-1470).